Once upon a time there was a story – in fact there is, with a child protagonist. You can call him Trump. He is Joshua but he has the same last name of the other one, who is currently talking. Donald Trump is the other one, and he tells a story: once upon a time, therefore, the story of a wall. A wall the he wants to be built to divide two peoples who are the same one and separate as many lands that are the same planet, where both are observed from the right distance. From up there in the sky, and down here, or in there, in the most sane part of our heart. 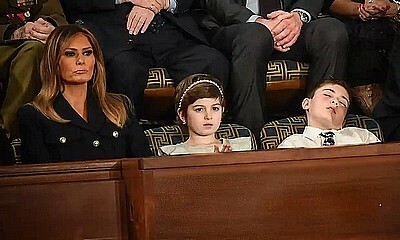 As a result, there was once, indeed there is, a child named Trump, Joshua Trump who is listening to the story of Trump's wall, the other, the big one, but he falls asleep and dreams: once upon a time, therefore, there was the dream of a child who is also called Trump, but he is Joshua, not Donald. He dreams of a madman with a disquieting orange face and a head surmounted by a grotesque hairpiece, which claims to be taken seriously talking about spending billions of dollars to build a wall, to divide two peoples that are the same and separate nations that are made of the same earth, when you look at it from the right distance. I mean up there, with the eyes of the wise stars, or here in the heart of a story that a child would also understand. In fact, there was once a man called Trump, but named Donald, who, like a child caught in a horrible nightmare, instead of waking up he wants to trap us with his tremendous delirium of fear and loneliness. Once upon a time there was the story of both, which will end only when Trump, the one named Joshua, will open his eyes and say: "Calm down, there’s nothing true about what you have heard."